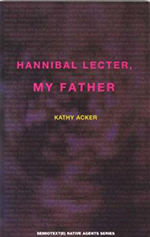 Edited by Sylvere Lotringer and published in 1991, this handy, pocket-sized collection of some early and not-so-early work by the mistress of gut-level fiction-making, Hannibal Lecter, My Father gathers together Acker’s raw, brilliant, emotional and cerebral texts from 1970s, including the self-published ‘zines written under the nom-de-plume, The Black Tarantula. This volume features, among others, the full text of Acker’s opera, The Birth of the Poet, produced at Brooklyn Academy of Music in 1985,Algeria, 1979 and fragments of Politics, written at the age of 21. Also included is the longest and definitive interview Acker ever gave over two years: a chatty, intriguing and delightfully self-deprecating conversation with Semiotext(e) editor Sylvere Lotringer—which is trippy enough in itself as Lotringer, besides being a real person, has appeared as a character in Acker’s fiction. And last, but not least, is the full transcript of the decision reached by West Germany’s Federal Inspection Office for Publications Harmful to Minors in which Acker’s work was judged to be “not only youth-threatening but also dangerous to adults,” and subsequently banned.